Breathing life back into the sholas…spreads from the Frontline (20 April 2012) article. Last summer while enjoying a holiday in Kodaikanal filled with hiking and outings with friends at the Vattakanal Conservation Trust it occurred to me that it was time to update the status of the ecology in the upper Palani Hills. Some of the observations were published in earlier blog posts but Bob, Tanya and I were also looking to reach a broader audience. 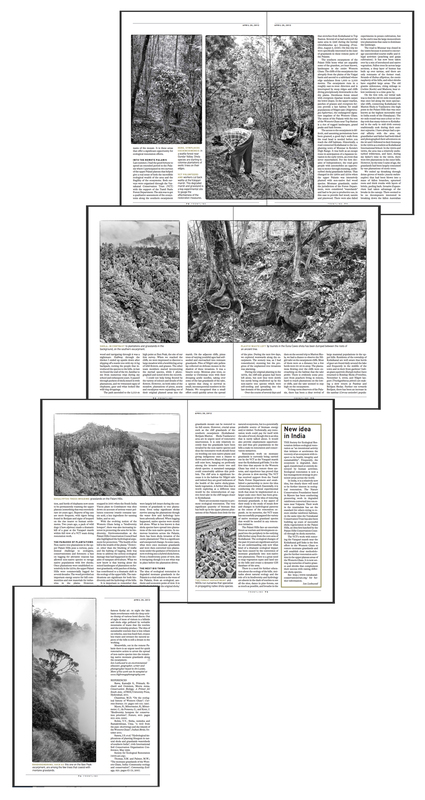 Frontline, with the able support of Vijaykumar has now published a series of my articles on the Palanis (2003), the Kurinji flowering (2006) and Bombay Shola (2010) all geared at raising awareness through text, photographs and maps. It was thus logical to look to them to highlight the current status of the upper hills. We took several fact-finding expeditions during June and July into the hills and the state of remnant montane grasslands was quite alarming. The spread of non-native species into these last outposts was significant. It took me a while to get the article and pictures together for Frontline but earlier this month it was published as Breathing Life Back into the Sholas(click here for the HTML version). Bob & Tanya, meanwhile worked with various authorities to get permission and raise funds to do some emergency restoration work in the habitats that we had visited. Their field notes had alerted people to the issues that I have highlighted in the article. On our family’s recent visit to Kodai I was thrilled to hear that VCT has the go head and will shortly be organizing a team to spend time doing restoration work in those highly sensitive cliff areas. Above and below are the spreads from the article. 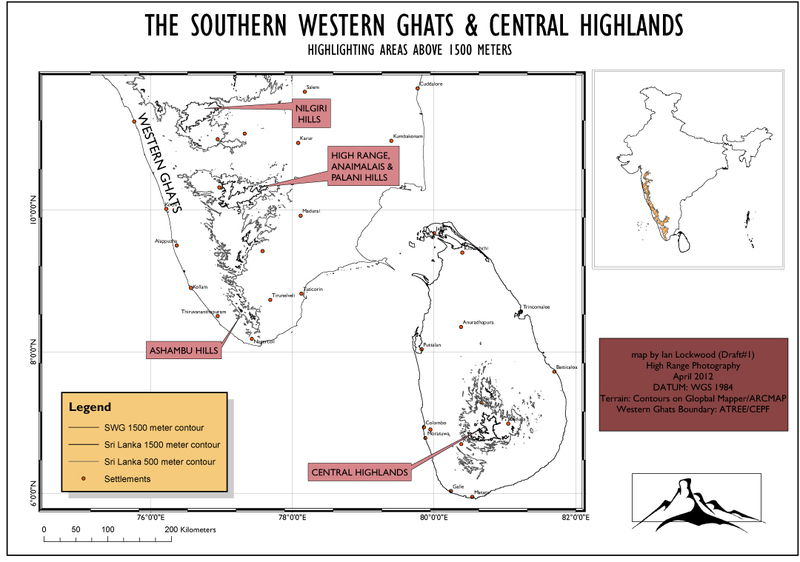 In spite of the title, the article is really about recognizing and restoring remnant montane grasslands habitats (sholas, you will read, are actually doing quite well in the Palani Hills). 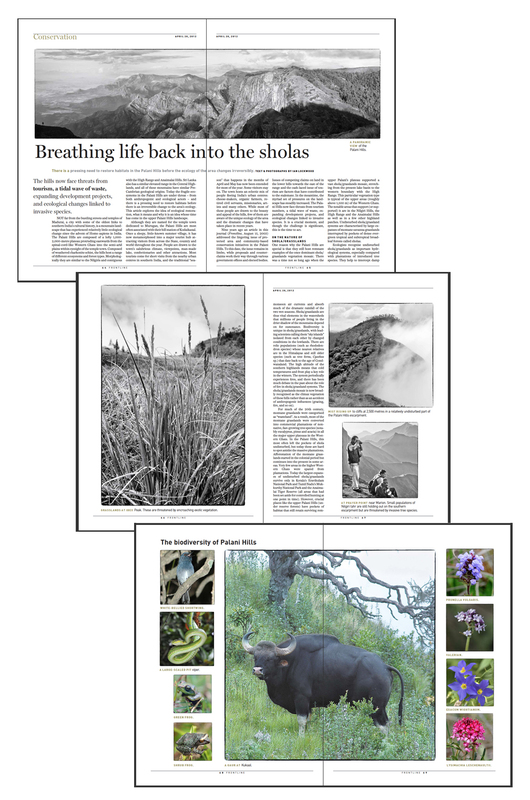 Breathing life back into the sholas…more spreads from the Frontline (20 April 2012) article.